^ FORMULA 1 PIRELLI MAGYAR NAGYDÍJ 2014. formula1.com. 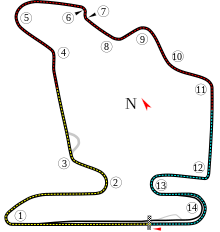 Formula One. [2014-07-27]. ^ Weather past 2 weeks in Budapest, Hungary. timeanddate.com. Time and Date AS. 2014-07-27 [2014-07-29]. （原始内容存档于2014-07-29）. ^ FIA Formula One calendar. Fedération Internationale de l'Automobile. [2014-07-27]. （原始内容存档于2014-07-27）. ^ 4.0 4.1 4.2 4.3 4.4 4.5 Race Preview. FIA.com. Fédération Internationale de l'Automobile. 2014-07-23 [2014-07-30]. ^ Weaver, Paul. Daniel Ricciardo pips Nico Rosberg for his first grand prix win in Canada. The Guardian. Guardian News and Media. 2014-06-08 [2014-07-30]. ^ Noble, Jonathan. Max Chilton changes F1 chassis after "balance issues". Autosport. Haymarket Publications. 2014-07-24 [2014-07-30]. ^ Lotus E22 - new front wing endplate. Formula1.com. Formula One. 2014-07-26 [2014-07-30]. （原始内容存档于2014-07-29）. ^ 2014 Formula One Sporting Regulations (PDF). FIA.com. Fédération Internationale de l'Automobile. 2014-03-12 [2014-07-30]. ^ Beer, Matt; Straw, Edd; Freeman, Glenn; Anderson, Ben; Mitchell, Scott. As it happened: Sunday - Hungarian Grand Prix. Autosport. Haymarket Publications. 2014-07-27 [2014-07-30]. ^ 11.0 11.1 Qualifying Results. Formula1.com. Formula One World Championship Limited. 2014-07-27 [2014-07-27]. （原始内容存档于2014-07-28）. ^ 12.0 12.1 FORMULA 1 PIRELLI MAGYAR NAGYDÍJ 2014. formula1.com (Formula One). 2014-07-27 [2014-07-27]. （原始内容存档于2014-07-30）.